"The purpose of man is to show forth the nature of God," says Joel Goldsmith in Man Was Not Born to Cry. "Man is the great glory of God. Man was not meant to cry, and all his tears are shed only because of a sense of limitation. 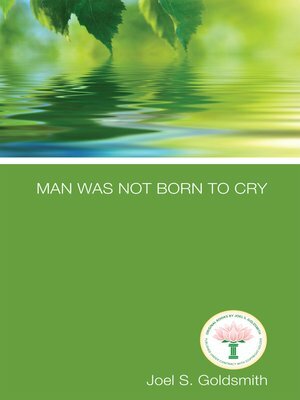 Man was not born to cry!" With that provocative statement, Goldsmith takes the reader on a journey that reveals the way to rise out of this sense of limitation. "You know you have a body and you know you have a mind, but you have not come to know the You that has the body and the mind. This is the You that is the adventure of life, and the adventure of life is the awakening of this You." As if giving private instruction to the reader, Goldsmith lays out the spiritual principles and practices that lead to liberation. He begins with the fundamental truth that God constitutes individual being, and explains that living in the conscious awareness of this truth can move us out of the personal sense of life that is the root of our problems into the spiritual consciousness where we live in glorious freedom under grace. Building on that foundation, Goldsmith details the other major principles of the Infinite Way. Emphasizing the role of prayer, he reminds us that prayer is not asking or pleading with God, but a resting in silence and a listening for the "still, small voice." All along the way, he helps the reader empty out old theories, concepts, and beliefs and make way for the "new wine" of Spirit. Never one to give students an unrealistic view of what it takes to have such a profound spiritual realization, Goldsmith emphasizes that this transformation in consciousness requires commitment, dedication, and continual practice of the principles. "When we come to the place of praying without ceasing, abiding in the Word and letting the Word abide in us, dwelling in the secret place of the most High, living and moving and having our being in the consciousness of truth," he says, "then we can look forward to harmony."